Ah, the morning conundrum: it's not only matching your jewelry to your outfit, it's finding that earring that fell between the sofa cushions and the necklace you took off last night when you got home and can't find. 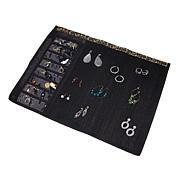 Time to get organized with the space-saving jewelry scroll. 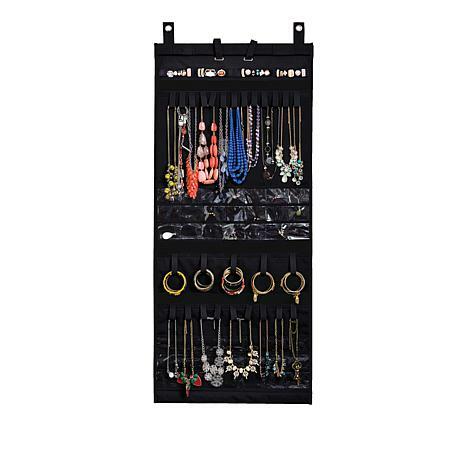 There's space for approximately 150 pieces of jewelry, and because it hangs over the door everything is in front of you in one tangle-free place. Here's your jewelry at a glance. Conundrum solved. 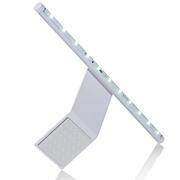 This organizer is the best! It holds so much and is very sturdy!!! So happy i ordered it and will get much use out of it!!!!!!! This item is well made. It can hold numerous piceces of Jewerly. I did not fold it works better hanging on a closet door. this works great on the back of the closet door. Except it should be made so you can hang it beside your clothing, not have to use the full width of the bag to hang it, the hanger doesn't adjust. But, it is a wonderful tool for keeping ones jewelry straight.